A Product for Acne Sufferers! At 20, I would like to have told the blogosphere that yes, your spots go away after your teenage years. I'm in final year of university and I STILL get spots the size of little mountains! A brief history of my skin: I have suffered from acne since about the age of 12-13, this was treated with a course of strong medication called Roaccutane. I don't advice this to everyone, my skin got so much worse before it got better. I am now left with scarring and a few spots here and there which flare up with hormones. 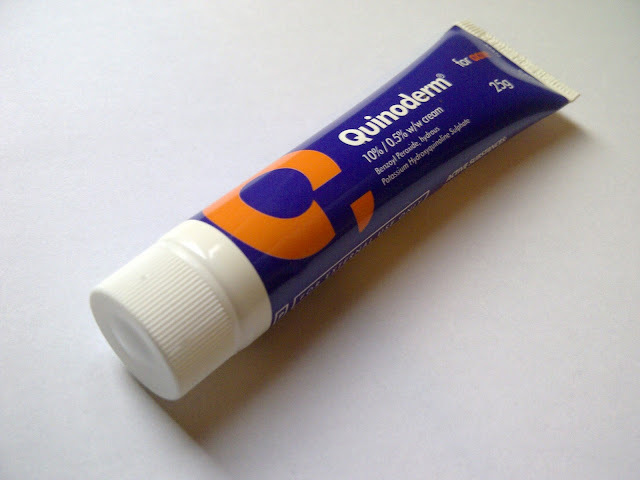 I recommend Quinoderm, I got this over the counter in Asda for a few pounds and it's worked wonders! Originally I was looking for Panoxyl, but the pharmacy assistant told me they no longer stock it and Quinoderm was it's replacement. It's a gel like formula that you apply directly onto the spot, it does sting a little but it's not uncomfortable. I like the stinging sensation, makes me feel like it's actually working! I just dot this on my spots and any little blemishes that are forming, it's a miracle worker, my spots are a lot better after applying this at night! Widely available, don't need to see a doctor. Stings slightly but not unbearable. This would be a great product for most acne sufferers but if you are really struggling with spots, it's best to see a doctor and get something stronger prescribed. Have you ever tried Quinoderm? Got any other acne fighting recommendations? Labels: acne, blemishes, panoxyl replacement, quinoderm, spots, treatment. This product sounds great lovely :) I hate it when my skin flares up as it gets really bad. Might have to pick this up and see how it works, give my sudocrem a break lol.